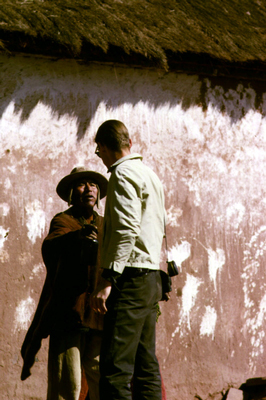 The Bolivia Project (1964-1967), at the request of the U.S. Peace Corps, the Research Institute for the Study of Man (RISM) in New York initiated a three-year epidemiological and ethnographic research project in Bolivia. Directed by Drs. Vera Rubin, Lambros Comitas and William J. McEwen, the project had two major related objectives: the delineation of the characteristic social features of rural Bolivian communities in different ecological regions of the country, and the identification of the major problems of health and disease in these communities. Analyses of the sociocultural features, featured in Changing Rural Society: A Study of Communities in Bolivia, and problems of health care, featured in Epidemiological Studies in Bolivia, were seen as fundamental to the work of Peace Corps Volunteers and other community-level workers. The key to the study and its design was the Bolivian social revolution of 1952 when the Nationalist Revolutionary Movement (MNR) took and maintained power. The MNR made a number of significant efforts to help integrate a society that was sharply stratified, culturally heterogeneous and regionally oriented. Among the most important of these efforts involved land redistribution, nationalization of the tin mines, and establishment of institutional supports for the working population, electoral reform, and a dramatic expansion of rural education. The aim of the project was to study this aftermath at the community level. The project employed more than eighty social and medical scientists and assistants. Organized as teams, the anthropological researchers worked and lived in six rural communities; the sociological and epidemiological teams worked in all six. Each of these communities represented a major organizational type, ranging from a minimally stratified and non-politicized community to one complexly stratified and politically revolutionized. Four of the communities were situated in the rural towns of Villa Abecia, Coroico, Reyes and Sorata, and two were the Aymara pueblos of Compi and San Miguel. Partly as a result of the RISM Bolivia Project (1964-1967), The United States Office of Education in 1968 and 1969 sponsored a study of rural education in Argentina, Bolivia, and Jamaica carried out by Lambros Comitas, then Professor of Anthropology and Education at Teachers College, Columbia University and Associate Director of he Research Institute for the Study of Man. In 1969, Lambros Comitas taped the Bolivia CV Recordings, in the communities studied in the RISM Bolivia Project, utilizing a SONY Video Recorder and CV reel-to-reel videotape for helical scan video recorders.